Drs. 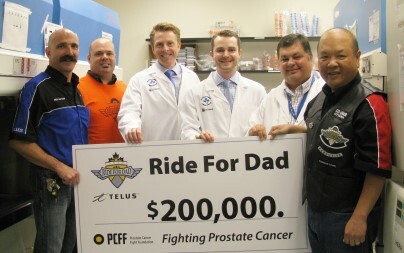 Christina Addison, Kristopher Dennis, Jim Dimitroulakos and Luke Lavallée were awarded a combined $200,000 from the 2015 TELUS Ride For Dad to study prostate cancer from four different angles. Dr. Lavallée will establish an advanced prostate cancer clinic and research program to ensure all patients in Eastern Ontario are receiving the most effective, safe and cutting-edge treatments. Prostate cancer commonly spreads to bones in the body, so Dr. Addison will investigate how prostate cancer cells ‘trick’ bone cells into helping let the new tumor grow in the new site, and Dr. Dennis will study why the radiation used to treat bone tumours often causes nausea and vomiting. In addition, Dr. Dimitroulakos will work with Dr. Rodney Breau to identify new combination therapies for aggressive prostate cancer.